The UnDISCOVERed Future World tour is a 4-hour experience, which takes participants through on-stage and backstage areas to learn about Walt Disney World’s park, Epcot. After visiting an amusement park with his daughter, Walt left feeling dissatisfied. He felt like he didn’t create any good, lasting memories, and he didn’t feel safe or fulfilled even as an adult. 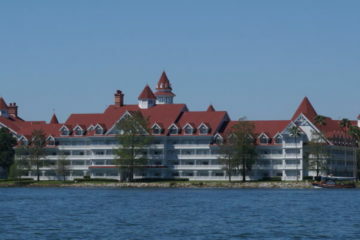 When Walt created Disneyland and then Disney World, he envisioned a theme park for all ages. ABC executives told him it would never work, but they believed in Walt, so they gave him a small budget, a small plot of land, and 11 months. Walt had to make important financial decisions like whether to have air conditioning or plumbing, but his sacrifices and dedication certainly paid off in the end. Walt’s original vision for EPCOT, or Experimental Prototype Community/City of Tomorrow, was an actual community where actual residents (about 20,000 of them) would live, work, and play. He envisioned a three-story city complete with libraries, office buildings, and homes. 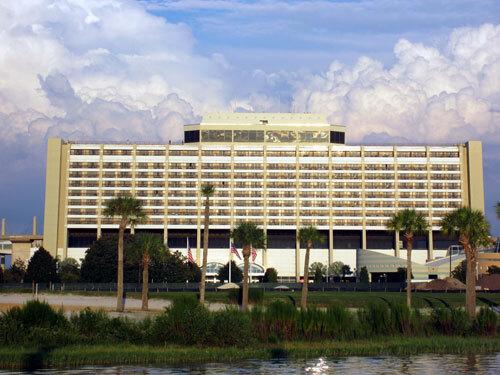 Unfortunately, since Walt Disney World Property is mostly on swampland, it was impossible to dig underground or build high structures on a ground that would not support the weight. Even more unfortunate is the sad fact that Walt Disney never got to see his vision open in any form since he passed away in 1966 but not before he clearly outlined his vision. If you have ever visited EPCOT, you are probably aware that this dome houses Spaceship Earth, a slow-moving dark ride that takes guests back in time and into the future and shows the development of writing, tools, and other great inventions. No raindrops will be falling on your head under Spaceship Earth. What is the behind-the-scenes scoop? 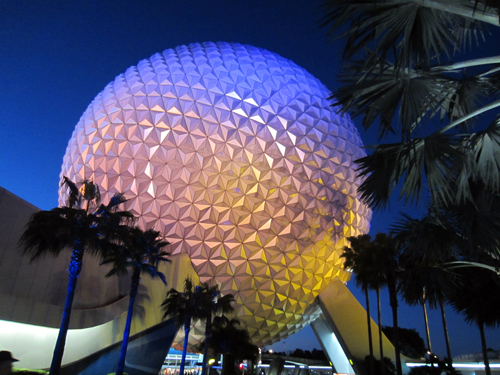 The geodesic sphere is perhaps the most iconic structure in Disney World besides Cinderella Castle. There are 11,324 triangles each made of an aluminum compound material called Alucobond, which is a little like the material used to create Apple’s MacBooks. During our tour, the most interest fact I heard about this dome is this: When a guest stands under the dome, he or she will not get wet. Why? Because there is a small, approximately 2-foot, space between the shell of the dome and the inside wall. Within this space, there is a gutter system. Cracks between each triangle allow the water to go into the gutter system to an aqua duct, which ultimately leads to the World Showcase. Walt was a huge proponent of education and learning, and this is shown in the Innoventions pavilions. 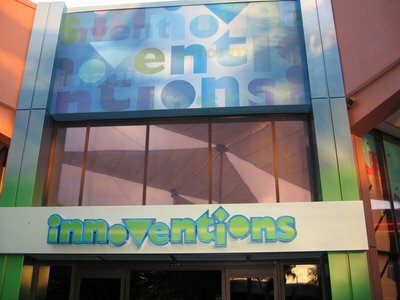 After learning about EPCOT’s icon, we visited Innoventions East and Innoventions West. Within these buildings, guests will find various learning opportunities including the Great Piggybank adventure and Where’s the Fire. The installments change occasionally, so be sure to check in every time you visit. Our favorite attraction was the Vision House, which is a (commercialized) look into the house of the future complete with zoned heating and cooling, a toilet with an automated, heated seat, and solar panels that charge the Chevy volt. Despite the several advertisements, this glimpse at technology, which currently exists shows guests ways to improve their home while decreasing their carbon footprint. Walt was always looking for the new and innovative. While on a business trip, he found a small talking bird. After playing with the bird, he decided he could use this in his parks! He purchased two (one for his wife and one for his designers), and audio-animatronics was born. With his designers, he created very life-like structures including Mr. Lincoln, which premiered at the New York Worlds Fair. Mr. Lincoln appeared so real that people began throwing things at him to see if he moved or flinched. Disney World currently uses the audio-animatronics technology in several rides including It’s A Small World, The Haunted Mansion, and Spaceship Earth to name a few. The largest audio-animatronic in the world is pictured below. Would you believe this is an audio-animatronic? That’s right! 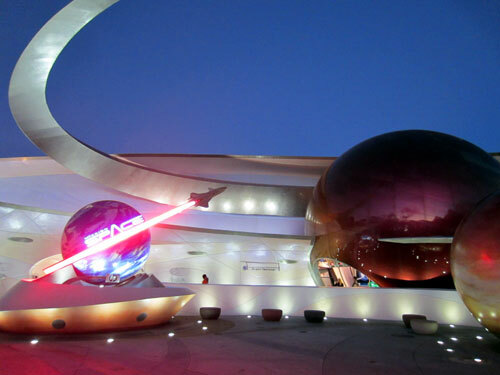 The Found of Nations in between Innoventions East and West, which holds 149,000 gallons of water, is coordinated with music (audio), shoots dancing waters (anima-) high into the air (higher than Spaceship Earth), and uses technology (-tronics) to make it all happen. 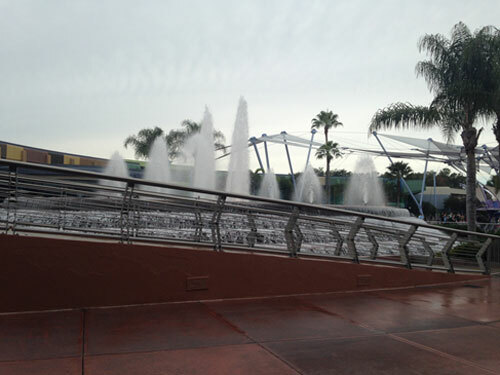 Interestingly, this fountain was dedicated shortly after EPCOT opened (in October, 1982). Dignitaries and representatives from 29 nations each poured one gallon of water into the fountain symbolizing the coming-together that Walt desired. Directly behind the Fountain of Nations, there is a large circle in the sidewalk. 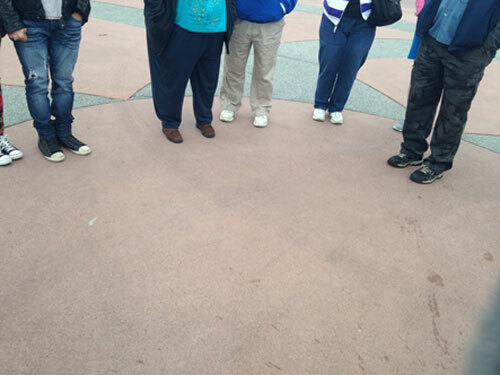 This circle represents the center of Walt Disney World. Next time you visit The Mouse, be sure to take a minute out of our busy vacation and stand in the center of The World. The symbolic heart of Disney World. 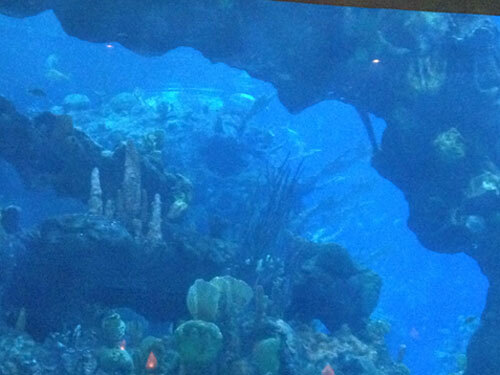 Have you ever visited the Coral Reef restaurant behind Finding Nemo and Friends? How about the aquarium at the end of the ride? If you haven’t, you’re missing out! I have to admit, I didn’t know this existed, but it is my new favorite spot! The aquarium is the second largest in the world with the first largest being at Atlanta, Georgia Aquarium. This is one big aquarium. If you look hard enough, you’ll see stingrays, sea turtles, dolphins, sharks, and all kinds of fish. 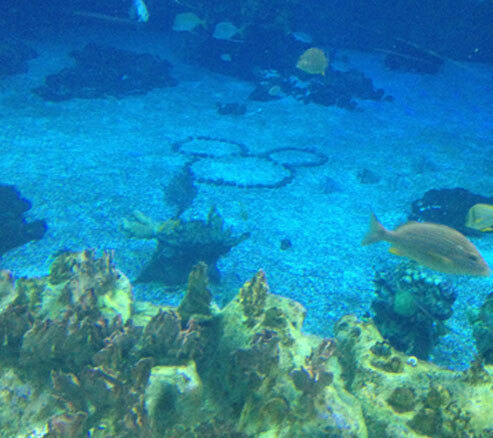 You might even find Nemo and Dory! 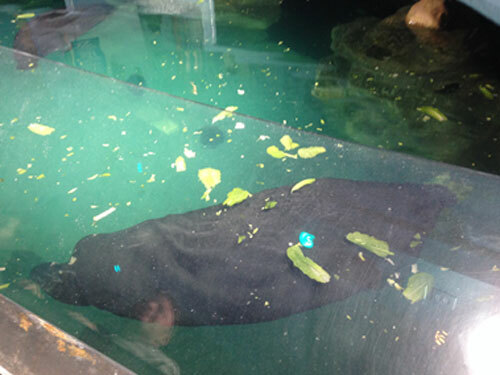 The Seas houses two manatees who were rescued from the wild. Currently, This is Lil’Joe and Lou (pictured below) live in The Seas at Walt Disney World. 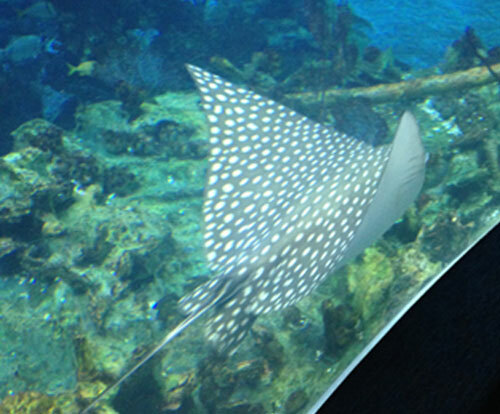 He Lil’ Joe was injured by a ship’s propeller and is being rehabilitated in The Seas pavilion. This is Lou. He was orphaned and is also being rehabilitated at Walt Disney World. This beautiful mural was created by a father/daughter duo completely by hand. Both sides are identical except for one thing. The designer wanted to put a signature on the wall, but Disney Imagineers said that it would damage the integrity of “the show”, so they allowed him to place an emerald, the birthstone of his first-born child, in the wall near the entrance on the right side. See if you can spot it the next time you visit The Land. The Land pavilion houses one of EPCOT’s most popular rides: Soarin’. Soarin’ was originally created from an erector set, which an Imagineer found in his attic over Christmas break. They were frustrated that they couldn’t figure out a way for Soarin’ to happen, so they decided to go home with their families for the Holiday. The Imagineer returned with his model, and Soarin’ was born! 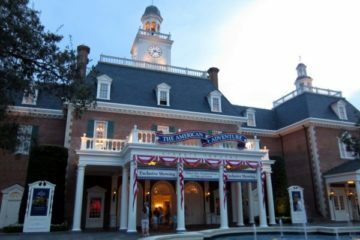 The popular attraction opened on May 5, 2005. If you pay attention, you can hear the flight attendant welcome you to flight 5505 (5/5/05) before you enter the ride. Soarin’ is made up of three levels: the first level goes up 40 feet, the second, 30 feet, and the third, 20 feet. We got insider information that Soarin’ may soon receive a makeover allowing guests to Sour over the world landing in whatever park they are visiting at the time. The Land is also home to a delicious restaurant: Sunshine Seasons. Most people aren’t aware that the sitting area for Sunshine Seasons represents all four seasons: Winter- to the right of Living with the Land, Spring- directly in front of Living with the Land, Fall- to the left of Living with the Land, and Summer- to the far left in front of Soarin’. 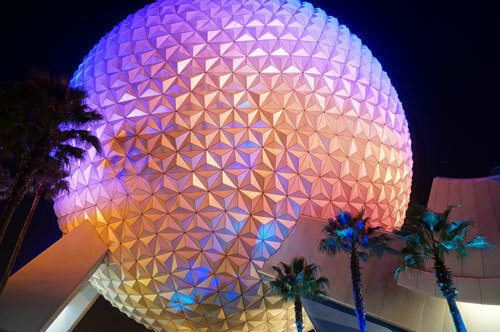 Do you like learning little-known trivia about Epcot?